Today’s painting is a portrait of Mola Ram, the big baddie from the Indiana Jones and the Temple of Doom film. 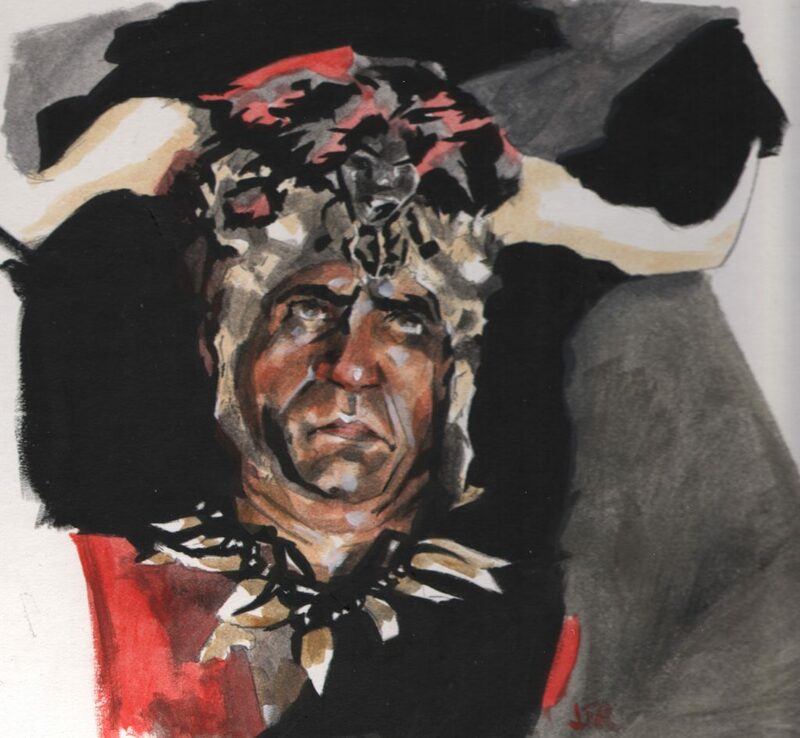 I have always been a huge fan of that film and the look of Mola Ram has always intrigued me. Plus, the guy can reach into your chest and pull out your heart and show it to you. Now that’s a crazy villain! The ending section of that film where Indy goes back to the mines to free the kids is my favorite section of any of the Indiana Jones films. For the painting process of this painting I went back to my comfort level and did this one with thin layers. After completing the drawing I laid in the black with no medium to thin it out. But, the rest is all painted with thin layers of oil. And then capped it off with some white highlights. And for this painting I used the Zorn palette choices when picking my colors, which means I only used black, white, cad red and yellow ochre. The Zorn palette is one I have been playing around with lately and will be popping up again this month. I was immediately attracted to the intensity in this painting. You do have to love someone who is about to “pull” out your heart. I tend to use too many colors and the light contrast becomes less evident. I think it would bode me well to use a more limited palette, such as Zorn. Also your “Movie” paintings are interesting compositions. Thank you Laurelle! I was checking about your paintings and I think your use of color and color choices work for your subject matter. I would imagine that it comes from your life experiences visiting and living in so many different areas. I am always a bit thrown off to use bright colors. Really nice. I especially like the limited color pallet. Makes for a very dramatic painting!